A typical climb up Mount Rainier takes about 18 hours spread over three or four days. But for Liam O'Sullivan last Tuesday, the time to beat was 4 hours, 49 minutes, 35 seconds, an unofficial record set July 11 by his friend and fellow guide Justin Merle. He did, by about 3 minutes. After a carb-rich pasta dinner and four hours of sleep, Liam O'Sullivan woke up at 2:30 a.m. last Tuesday, left Ashford, Pierce County, and drove to Mount Rainier's Paradise base area, elevation 5,400 feet. He packed light: a nylon shell, light pants, a hat and headlamp, sunglasses, gloves, his iPod (the playlist is his secret), five energy gels, one packet of energy chews, two hiking poles and just 2 liters of a sports drink in a pouch strapped to his back. That gear would hardly sustain a normal trek up the Cascades' tallest peak, which usually takes about 18 climbing hours spread over three or four days. But that's not what O'Sullivan, 29, had in mind. Despite the competition, each man said the race to the top was more about testing himself than beating his buddy. "It's nice to have the record, but it's really more about challenging myself and doing something I've dreamed about for years," O'Sullivan said. O'Sullivan, a native of Seattle's Magnolia neighborhood, was introduced to mountaineering on the hometown hill at age 15 when his sister led him up to Mount Rainier's Camp Muir. Since then, he's reached Rainier's summit 101 times. "When you climb this mountain as much as we climb it, you start looking for a challenge," O'Sullivan said. "The climb itself becomes routine and your mind wanders." For adrenaline junkies with competitive instincts like these mountain guides, the speed record is a natural goal, they said. There are no official time records kept, but the unofficial marks are well-known in climbing circles. 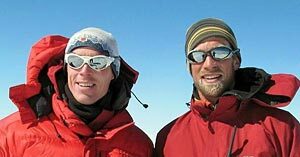 O'Sullivan and Merle have been chasing the record for almost a decade, since they were encouraged to by their colleague, Craig Van Hoy, who held the record (then 5 hours, 22 minutes) when they started guiding together in 1999. At the beginning of this summer, just after Merle's second time summiting Mount Everest (where O'Sullivan has never been), Merle and O'Sullivan co-guided a trip on Rainier together. They talked about the record, both of them knowing the other was planning a run at it. "It's just like any endurance sport, going out to see what your body is capable of," Merle said. A lithe 6 foot 1 inch, O'Sullivan said general fitness, as with most any athletic feat, is the key to speed climbing. Other than the conditioning he gets from regular mountain guiding, he hardly prepared for it — just three 49-minute sprints up 4,167-foot Mount Si at North Bend. Merle trained even less. Compared with the kind of training triathletes or marathon runners would do, "effectively we both did it cold," O'Sullivan said. For O'Sullivan, an EMT and former firefighter, the record-setting climb was his last hurrah before starting medical school at a University of Washington program in Spokane this week. Leaving Paradise at 4:20:08 a.m., O'Sullivan blitzed to Camp Muir, elevation 10,000 feet, in a blazing 1 hour, 24 minutes and 31 seconds. He took a 7-minute break to swap his running shoes for boots he had stashed there beforehand and to drink some water. It was a different strategy from Merle, who never stopped moving his entire climb. In a record 3 hours, 11 minutes, 22 seconds, O'Sullivan signed the log at the summit, elevation 14,411 feet, about 16 minutes ahead of Merle. Then he tore back down the mountain, dropping 2,000 feet in about 20 minutes. But then a leg cramp stopped him in his tracks. He was paralyzed. Despite his huge lead to that point, O'Sullivan knew he would be lucky to make it down just a step ahead of Merle, let alone record a dramatically faster time. After recovering for a minute he proceeded cautiously, stopping again for water at Camp Muir, leaving there just 30 seconds ahead of Merle. In the last stretch, O'Sullivan thought it was all over. He reached the mountain's snowfield about 9 a.m., but it hadn't softened as he'd expected. Sliding down firm ledges of snow, careful to avoid any awkward step that could trigger another cramp, O'Sullivan wiped out three times. Knowing this would be his last chance of the season, O'Sullivan pushed himself down the last 1,800 vertical feet as hard as he could, his heart racing and his feet blistering. Back at the parking lot after 4 hours, 46 minutes, 29 seconds, O'Sullivan radioed Merle, who congratulated him and asked his time. "Three minutes?" Merle said. "I'll just have to try and steal it back from you next year." "Absolutely," O'Sullivan answered. "I encourage it." No sooner had O'Sullivan claimed the record than several others were on his heels. Mountain guide Michael Horst tried the next day but failed to break it. Lhakpa Gelu Sherpa, who once held the record for fastest climb on Mount Everest (10 hours, 56 minutes, 46 seconds), is now guiding on Rainier. He is making his run at the record Saturday and has set a goal of 4 hours. Chad Kellogg, who in 2004 set a record at 4 hours, 59 minutes, 1 second, said he hopes to reclaim the title as well. O'Sullivan's record lacks third-party verification, and there's no consensus on how a time could be deemed "official" anyway. "That's the beauty of it: It's not an established event," O'Sullivan said. "It's just going out there and seeing what you can do, that day, that mountain, that weather." O'Sullivan's claim is based on a GPS watch he used to track his progress and, more importantly, his word. But his colleagues said there's no reason to doubt it. The tight-knit community of climbers know and trust each other  often literally with their lives. "In this community, it's a big deal," O'Sullivan said of the record. "I don't know if it matters much to anyone else, and I don't know if it matters much to us whether it matters much to anyone else."